I thought today would never end! we woke this morning and it was beginning to rain but not too heavy so we looked at the radar and saw that it would clear by about 10am and it did - we left at 9.30am. It was a nice gentle climb up until 19km and then it was sheer hell for me! We had looked at Bike Route Toaster before hand and they gave an average of around 6% gradient for the hill and I thought that was okay but I sought of didn't realise that they average it so parts of the hill could be 10% while other parts are 2% (hence the average is 6%!!!) so on those 10% parts I walked as you can see from the photo below! Neil managed to ride all the hill but some of it was just too steep for me so I got off and walked the bike (which was just as hard!) although the photo above was taken near the top and although that part of the hill wasn't steep I was just sort of over it! I think it was the excess weight I was carrying in Koutas wet basket!!! The top of the hill is at 26km and then it is a quick 3km down (but not as steep - actually I think it would have been an easier gradient for going uphill!) and then along to Merton where it was cold and windy and time for a hot cuppa. At that point we joined the Maroondah highway and it had a wide shoulder all the way to Yarck (our turnoff). 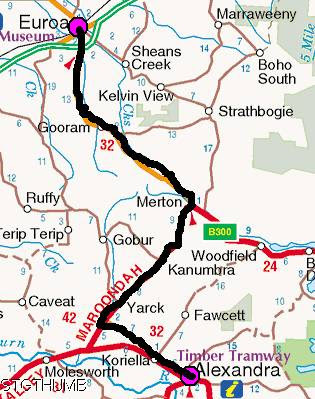 Just out of Merton there is a gradual hill up to Burtons gap for a couple of kms and then it is a long lovely gradual down hill to Yarck. It was around 15km and would you believe this we were robbed of our down hill - we had such a strong south westerly head wind that we had to pedal down the damn down hill - I was sooooooo miffed at being robbed of a proper down hill! Neil just told me to get over it! looks very hilly doesn't it! From here this road hooks us to the Goulburn Valley Way and steadily climbs for a few kms and every now and then we keep seeing these signs about the new rail trail being constructed but it looks like they are quite a few years away from that. at the bottom of this one both Kouta and I had very watery eyes! I was relieved to get to Alexandra it was tough today with over 700m of climbing and only 400m of ascending (of which 350m we had to pedal!) and we saw that the showgrounds was also a campground so we came here as we knew it would be cheaper than staying in a tourist campground - $15 with power since it was only a computer! We have decided that we might not have a rest day at Eildon since the days won't be as tough or as long as today if that is the case then we should be home on Wednesday - I think Neil really wants to get home!